Rep. Thaddeus McCotter stopped by the mini-cattle call in Mackinac to reflect on why his presidential campaign didn’t take off. I tried to do it the old fashioned way by focusing on Iowa and New Hampshire. But you have to have a national platform before you can get on the debate stage. If you aren’t in the debates, you aren’t going anywhere. The point of the McCotter campaign was this: There seemed to be an audience for dry, laconic criticism of America’s wayward politics and ruling class, so if the candidate got on TV, he could capitalize and build on that. He never ended up getting on televised debates, or raising much money, so few people heard him. Here is what you missed. April 27: Pundit S.E. Cupp, who appears on Red Eye even more often than McCotter does, suggests that he could be a 2012 dark horse. June 23: A mystery bidder nabs a prime lot for the Ames Straw Poll; it turns out that she shelled out $17,000 on behalf of McCotter. 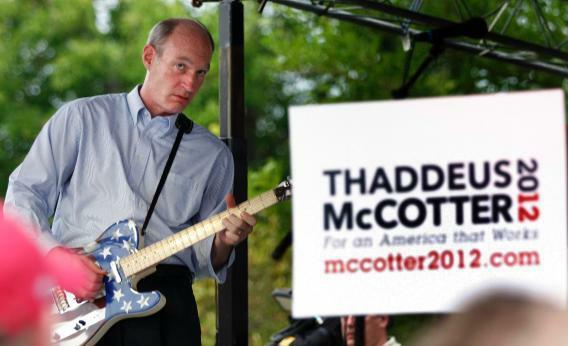 July 2: At an outdoor freedom fest back in Michigan, McCotter launches his campaign. July 9: McCotter seemingly finds his purpose, attacking the “Obama-Romney economy.” But with no debates or forums to expand on the attack, it fades. July 21: McCotter appears in a debate for the first and only time, tweeting along with Newt Gingrich and other candidates in the “first-ever Twitter presidential debate,” moderated by Cupp. July 24: The rules for the next Iowa debate come out, and McCotter mistakenly believes that they’ll let him on stage. No such luck. August 13: McCotter comes dead last in the straw poll with 35 votes, losing even to candidates who didn’t campaign there. His campaign tent is a festival of sadness: The candidate plays guitar with a band of friends, as a friendly guy in a van hands out ice lollies and a dozen or so people watch and listen. September 12: Flanked by Grover Norquist, McCotter announces a bold Social Security reform plan. He urges other candidates to propose their own. No one does. That night, as the other candidates debate, McCotter tweets about what he’s watching instead. September 22: McCotter ends his campaign. The Dow Jones falls nearly 500 points.